Whitney Caskey, a native of Jackson Parish and a graduate of Louisiana Tech, continues to contribute to the regional art community as a member of NCLAC. 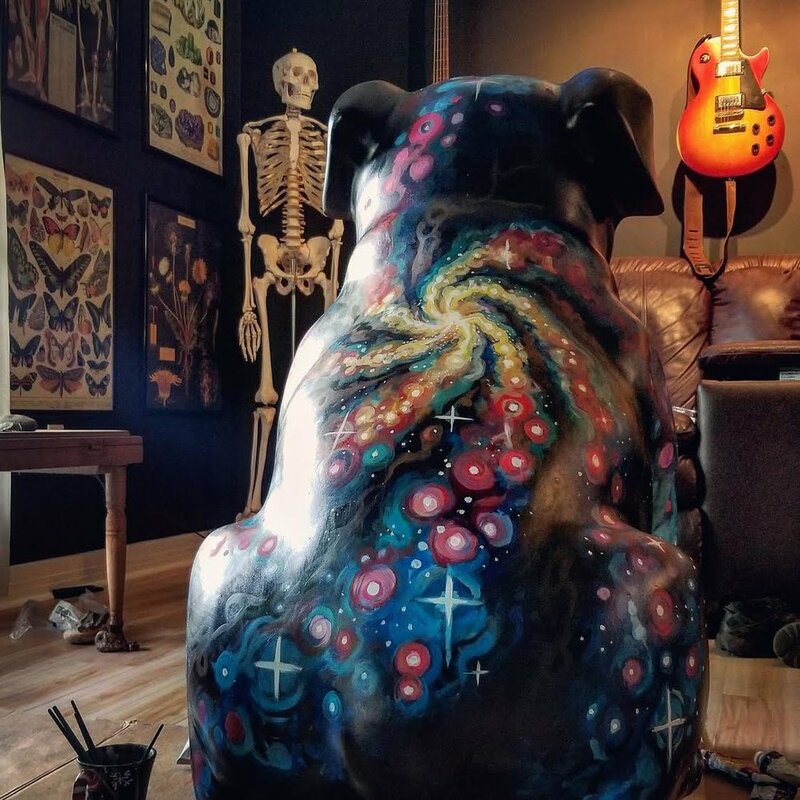 She has established a reputation for proficiency in several different kinds of visual art, with a repertoire that includes painting, photography, and body art. She is also one of the artists who are currently preparing the painted bulldog statues that will be set up around Ruston this fall. Her multifaceted career has allowed her to gain a unique perspective on how the different genres of art relate to one another and attain value. Looking back on her own journey as an artist, Caskey believes that the way she approached her eclectic artistic interests demonstrate how different fields of artwork contribute to each other. While earning her two Bachelor of Fine Arts degrees in Studio Art and Photography, she learned the rules of composition, color theory, and other principles of art that she continues to apply now as a tattoo artist at University Ink. She feels that attaining knowledge in each field has deepened her wholistic understanding of art and her ability to apply that understanding to her work. Caskey has also had direct experience in how society values each kind of artwork differently. The valuation of art in general gave her misgivings about her career path when a concern for the likelihood of making a living within her interests almost persuaded her to pursue the study of biology instead. While she received almost universal support for her choice to become a painter and later a photographer, she did have experiences in which she found that her work in those genres was sometimes undervalued. She recalls being asked every now and then to draw a sketch or take pictures for free, even though she was endeavoring to take that work on as a profession. Her decision to change her plans and pursue employment in body art arose fortuitously from a personal interest in the art form and an uncertainty as to choice of career that her academic studies had not been able to fully resolve. She has found since then that her work as a tattoo artist is never undervalued. Because of the extremely personal and permanent nature of body art, those who hire her to create tattoos always take her work seriously. Nevertheless, negative notions of body art remain prevalent, especially as they pertain to women. She would like to assure readers that the people who purchase her work are neither “trashy” nor members of a gang, but rather ordinary people, like nurses and teachers, who appreciate her art. Of course, art is for the community as well as the individual, and Caskey sees Ruston’s public artwork, like the new murals, as a fun and exciting way to get the community involved in supporting the arts. The bulldog project she is working on is no exception, and she looks forward to the statues’ unveiling on September 7th in Railroad Park.